Slowing Down The Splits – Your Life. Your Hustle. So my biggest problem is curbing my enthusiasm in anything that I do. Why would that be a problem? Well if you’re trying to increase stamina and distance on your runs you need to pace yourself better. In other words I can’t run a 9 minute mile in the first mile of a four mile run. My average pace for 4 miles is 10:13/mile. So when I break out at a sub 9:00 I’m really hurting my chances of making it 4 miles without stopping. Stopping really kills my motivation and sense of accomplishment. I’m going for a straight distance run…not an interval run. Take today’s run for example. I started a little too fast the beginning and even though I made myself go much slower on the second half of the first mile the damage was already done. 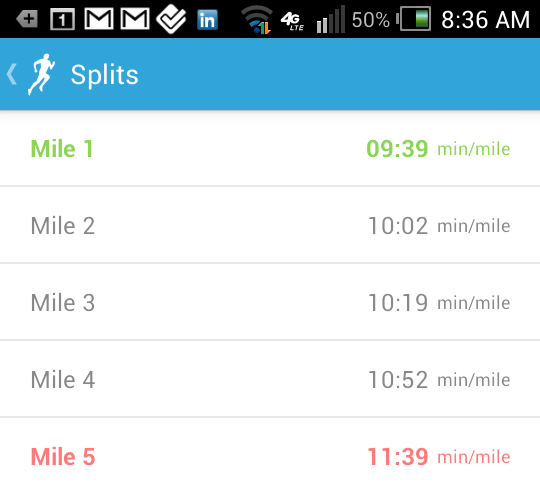 I did okay for mile two and three but mile four I really started to drag. I need to keep my pace no faster than 10:00/mile for the first three miles. On mile four and five I can increase my pace if I’m able to. I’m still carrying too much weight to go much faster. I’ve got another 30 lbs to lose before I feel comfortable to pursue a 10 mile goal. I’d like to be there by January 1st but that is too ambitious for me. I’m not much of a dieter and I’m trying to slowly modify my calorie intake so it’s something I can maintain versus a diet fad. Sure I could do Weight Watchers and drop 35 lbs by Christmas but I KNOW I would gain it all back. Yup…slow and steady…that’s me!